Outsider Art of the South is an intimate glimpse into the lives and work of thirty-four self-taught artists, two folk art environments, and one museum which tells the tale of a region's fast-disappearing way of life. Kathy Moses' thoughtful, insightful portraits introduce us to these men and women, some of whom are well known and some not so well known, but who all driven by a compelling need to create. Their stories are told with warmth, affection, and respect. For many of these artists, this is the first time they have been presented to a wider audience. Loaded with 440-plus color photographs, Outsider Art of the South beautifully illustrates the range of each artist's work, with more examples per artist than has ever been shown before. 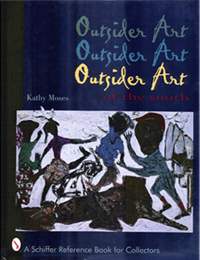 The book is also an invaluable reference guide, with a source section that lists museums and galleries where the art may be seen and purchased, a retail price guide, a bibliography, and many organizations, publications, shows and auctions devoted to Southern folk, outsider and visionary art. The author's background as a journalist and museum director, coupled with her knowledge and exposure as a gallery owner specializing in contemporary Southern folk art, make for a book that is factual, informative, and easy-to-read. It is sure to be a welcome addition to the libraries of current folk art collectors, and should whet the appetite of those who may just be learning about this exciting field of art. Size: 8-1/2” x 11”. 444 color & 12 b/w photos. Price Guide & Index. 240 pages. ISBN: 0-7643-0729-0 Hard cover $59.95. $69 shipped within the Continental United States. 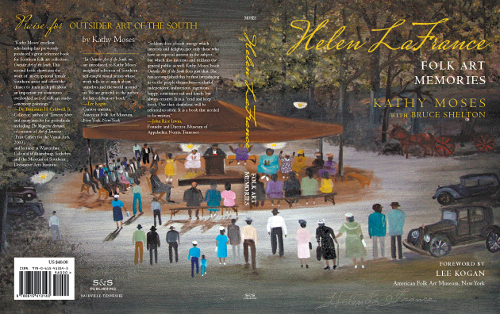 Buy the new book about self-taught Southern artist Helen LaFrance written by folk and outsider art authority Kathy Moses, with Bruce Shelton, and foreword by Lee Kogan, Curator emerita, American Folk Art Museum, New York. With over 200 color photographs, Helen LaFrance Folk Art Memories introduces us to this significant African American artist and her work. Born in 1919 in western Kentucky, LaFrance is the rare artisan who is able to work in more than one medium. She is an accomplished painter, quilter, wood carver, and Biblical interpreter. However, her real skill is her ability to connect with the viewer emotionally through the memories they share. Visually recording a fast-disappearing way of life, she paints scenes of a time and place that so many of can respond to. These paintings fall into a category of American folk art known as Memory Painting. The author's close acquaintance with LaFrance gives Helen LaFrance Folk Art Memories a perspective it wouldn't have without that association. Size: 8-1/2" x 11". Soft cover, 220+ color photographs. © 2010 Just Looking • All rights reserved.